Some of the best tools start out as great little ideas from grass roots enthusiasts. Take the "Jasik Plug Boot Tool". It solves a confounding problem for C4 ZR1 owners: how to easily remove spark plug boots. The C4 ZR1's DOHC LT5 V8 uses a spark plug configuration sort of like that of old Chrysler Hemis–the spark plug in a deep well, between the intake and exhasut valves. The spark plug boot is a long rubber tube with a larger diameter cap at the top. The cap has a ridge around it which snaps into a groove machined in the cam cover at the top of the spark plug well. One a set of plug wires has been in service for a while, the boot somehow "takes a set" in the cam cover groove. When one goes to change plugs, sometimes the boot is very difficult if impossible to pull out of the cam cover. Many people make the mistake of yanking on the wire itself. That can be the kiss-of-death to the plug wire because if it doesn't damage the terminal a the end of the boot, it damages the wire itself. Northern California resident, Stever Jasik, a longtime ZR1 owner and who has machine work as a hobby, became tired of the hassle of pulling the plug boots out of his LT5 by hand so he invented a simple solution. 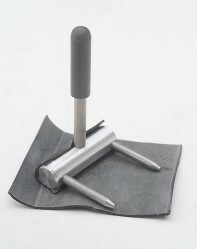 The "Jasik Plug Boot Tool". One simply slides the forked part of the tool under the top of the boot then pushes down on the lever. Out pops the plug boot. The Jasik Plug Boot Tool has a rubber protective sheath around its fulcrum bar and comes with a spark square of rubber is the original sheath wears out.